I was eagerly anticipating but half dreading watching The Dark Knight because of Heath Ledger. Believe all the hype about this excellent film: it is violent, dark, moody, relevant, replete with moral complexities. I never thought a superhero movie would leave me feeling sucker punched. Then again, Christopher Nolan's Gotham is nothing like we've ever seen before. But Mr. Ledger owns this movie. 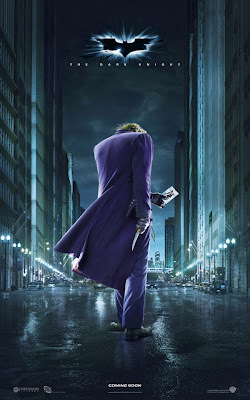 His Joker is a tour de force, certainly worthy of an Oscar even if he wasn't taken from us too soon. It was chilling to hear him say " You see, madness, as you know, is like gravity. All it takes is a little…push. ", knowing what's transpired since.